We offer more ENERGY STAR® systems than ever. ENERGY STAR Systems incorporate eco-comfort technology, dual and triple-allergen filtration, and whisper-quiet operation. 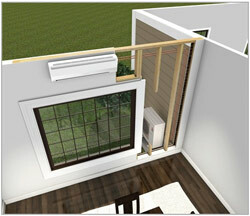 New technology revolutionizes the heat pump. Space-saving design means easy and unobtrusive installation. Mitsubishi offers more ENERGY STAR systems than ever, and we're the industry leader. We have Energy Star rated systems with dramatic increases all the way up to 26 SEER. Our units incorporate eco-comfort technology, dual and triple-allergen filtration, and are whisper-quiet. Eco-comfort technology makes these systems smarter in how they use energy and minimizes their impact on the environment. Plus, there are many advanced features like the i-see™ Sensor, that automatically detects room temperature differences and adjusts for greater comfort. Mitsubishi Electric's advanced multi-stage filtration systems dramatically reduce allergens and help eliminate odors. Our indoor units operate with sound levels starting as low as 19dB(A), quieter than a human whisper. Mitsubishi Electric offers the most technologically advanced heat pump systems in the world. Unlike older, inefficient heat pumps, there is no cold air delivery with Mitsubishi Electric's Cooling & Heating systems. The Hot StartTM system doesn't activate the fan until the desired temperature is reached, so it never blows cold air. Select models use Hyper-Heating INVERTER (H2i®) technology that operates effectively down to -13º F. These models give true year-round comfort from a single system. These units provide easy installation, simple service and longer warranties. Although, with our industry-leading reliability record, you won't have to worry much about that. Better yet, we've extended our warranties to seven years on compressors and five years on parts. Mitsubishi Electric Cooling & Heating systems use advanced technologies to provide the ultimate in comfort control while minimizing energy consumption. INVERTER-driven compressor systems use only the exact amount of energy needed to cool or heat an area. So you can save energy and money while enjoying complete control over your comfort year-round. Zone control is one of the main technological benefits our systems offer, enabling you to control the temperature within any space that has an indoor unit installed. The ability to condition the spaces in use and not keep unoccupied spaces conditioned allows exceptional energy conservation. Individualized comfort control is available from one to eight rooms connected to a single outdoor unit. Standard and enhanced filtration systems provide air filtration that utilizes washable filters that can last up to 10 years; this feature is good both for you and the environment. Hybrid Catechin and blue-enzyme filters contained in each indoor unit remove allergens; each room has its own filter, therefore preventing cross contamination of air from room to room. Select systems incorporate an additional Platinum Catalyst filter for additional odor elimination. Hot-Start™ technology regulates the fan on the indoor unit so that it does not blow any air until the unit has reached the desired temperature, thus preventing drafts of cold air. i-see™ Sensor scans the lower portions of the room to detect hot or cold spots and to adjust temperature and airflow accordingly to maintain consistent comfort. H2i® technology, available on select systems, provides heating capability effectively and efficiently even when temperatures outside fall as low as -13º F. This technology provides heat in extreme climates either to supplement existing systems or to serve as the main system in a new addition. Control each room individually with handheld or wall-mounted smart controllers. Our controllers put comfort a push of a button away. Select Mode, Temperature, Fan Speed, Airflow, timer functions and more. The tried and true, smart technology behind the Mitsubishi Electric Cooling & Heating systems of today has evolved from our introduction in the 1950s. Our technology allows energy efficient, individual comfort control with minimal impact on your home since we offer both ductless and limited length ducted solutions. The technology behind Mitsubishi Electric Cooling & Heating systems is referred to in many different ways, including mini-split, multi-split, split-ductless, split-zoning, and variable refrigerant flow. Mitsubishi Electric split-zoning technology is the primary method for conditioning spaces in homes and commercial building around the world. 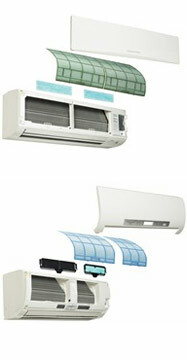 That is why Mitsubishi Electric introduced this technology into North America over thirty years ago. Split-zoning systems allow each room (or space) using an individual indoor air-handler to be controlled independently from other rooms, thus providing individualized comfort control within each room of a home. Controlling your comfort is easy. Just use the smart remote controller to get your perfect temperature with the touch of a button. Adjust your mode of operation between COOL, HEAT, DRY or AUTO. AUTO mode will automatically decide if you need cooling or heating delivered to the space to maintain the set temperature. You can even adjust fan speed and the direction of the vane (on applicable units.) Everything you need to control your comfort is right there in your room with you; not in another room or a different floor. Comfort control - room by room. Our INVERTER-driven compressor in the outdoor unit maximizes efficiency by automatically changing its speed to match the cooling and heating needs of a room. This technology allows us to ramp up compressor speed to quickly cool or heat a room (or multiple rooms) and reduce the compressor speed to maintain the ideal comfort level, while using less energy. This innovative system differs from conventional systems, which start and stop repetitively causing temperature variations and wasting energy. This feature is just one of the smart technological advances that make the Mitsubishi Electric Cooling & Heating systems superior to other comfort conditioning options. The advances in the heating performance of our systems are remarkable. Our H21® hyper-heating INVERTER technology can heat effectively even when temperatures outside are as low as -13° F. H2i systems can provide up to 100% heating capacity at 5° F and are extremely efficient. In fact, many qualify for ENEREGY STAR. Plus all of our heat pump systems feature Hot Start technology that delivers hot air from the very start of operation; that means no cold blasts or drafts.Our i-see™ Sensor automatically detects temperature disparities in a room, typically closer to the ceiling and the floor. It scans the room's ambient temperature readings and automatically adjusts airflow in the room. This process ensures that you always enjoy uniform comfort throughout the room. Mitsubishi Electric Cooling & Heating uses advanced technology to bring you quality products that provide the ultimate in comfort and control while minimizing energy consumption. Mitsubishi Electric systems use two small refrigerant lines plus power and control wiring to connect an outdoor unit to each individual air handler. This allows for easy installation in new construction and causes minimal disruption if you are renovating or retrofitting your home. i-See™ Sensor scans the upper and lower areas of a room to detect hot or cold spots and adjust temperature and airflow settings in real-time to maintain consistent comfort throughout the space. With these and other technologies the Mitsubishi Electric comfort systems provide energy efficient, quiet and environmentally friendly solutions for your comfort needs. A. The parts are warranted for a period of five (5) years to the original owner of the System. If any parts should prove defective due to improper workmanship and/or material for a period of five (5) years from the date of installation, MEUS will replace any defective part without charge for the part. Replacement parts are warranted for the remainder of the original 5-year warranty period. Parts used for replacement may be of like kind and quality and may be new or remanufactured. Defective parts must be made available to MEUS in exchange for the replacement parts and become the property of MEUS. B. The compressor is warranted for a period of seven (7) years to the original owner of this System. If the compressor should prove defective due to improper workmanship and/or material for a period of seven (7) years from the date of installation, MEUS will replace the defective compressor without charge for the compressor. Replacement compressors are warranted for the remainder of the original 7-year warranty period. Compressors used for replacement may be of like kind and quality and may be new or remanufactured. Defective compressors must be made available to MEUS in exchange for the replacement compressor and become the property of MEUS. C. Notwithstanding the foregoing, if the System is installed in a residential single-family home and registered within 90 days from installation, the parts and compressor will be warranted for a period of 10 years, to the original owner, so long as the original owner resides in the home. Specifically, if any parts and/or the compressor should prove defective due to improper workmanship and/or material for a period of ten (10) years from the date of installation, MEUS will replace any defective parts or compressor without charge for the part or compressor. The replacement parts and/or compressor are warranted for the remainder of the original 10-year warranty period. Parts and/or compressors used for replacement may be of like kind and quality and may be new or remanufactured. Defective parts and/or compressors must be made available to MEUS in exchange for the replacement parts and become the property of MEUS. D. Notwithstanding the foregoing, if the System is installed in a residential single-family home by a MEUS DIAMOND CONTRACTOR and registered within 90 days from installation, the parts and compressor will be warranted for a period of 12 years, to the original owner, so long as the original owner resides in the home. Specifically, if any parts and/or the compressor should prove defective due to improper workmanship and/or material for a period of twelve (12) years from the date of installation, MEUS will replace any defective parts or compressor without charge for the part or compressor. The replacement parts and/or compressor are warranted for the remainder of the original 12-year warranty period. Parts and/or compressors used for replacement may be of like kind and quality and may be new or remanufactured. Defective parts and/or compressors must be made available to MEUS in exchange for the replacement parts and become the property of MEUS. E. NO LABOR. These limited warranties do NOT include labor or any other costs incurred for service, maintenance, repair, removing, replacing, installing, complying with local building and electric codes, shipping or handling, or replacement of the System, compressors or any other parts. For items that are designed to be maintained or replaced by the original owner, the original owner is solely responsible for all labor and other costs of maintaining, installing, replacing, disconnecting or dismantling the System and parts (such as filters or belts) in connection with owner-required maintenance. Air filter cleaning and/or replacement for each applicable indoor unit are owner-required maintenance, and labor for this procedure is not covered under warranty. Please consult the applicable technical documentation for air filter cleaning and other maintenance procedures. F. PROPER INSTALLATION. This Limited Warranty applies only to Systems that are installed by contractors who are licensed for HVAC installation under applicable local and state law, and who install the Systems in accordance with (i) all applicable building codes and permits: (ii) MEUS’s installation and operation instructions: and (iii) good trade practices. G. REGISTRATION. To receive certain benefits under this Limited Warranty, as set forth in more detail above, the product must be registered within 90 days of installation. To register, the original owner may complete and return the postage-paid registration card by U.S. mail or may register the product online at www.mitsubishicomfort.com. MEUS Diamond Contractors may submit product registration information online via the extranet portal. Residents of California or Quebec need not register the product to receive warranty benefits, but are encouraged to do so. a. Contact the licensed contractor who installed the System or the nearest licensed contractor, dealer or distributor (whose name and address may be obtained on our website at www.mehvac.com(link is external)) of any defect within the applicable warranty time period. b. Proof of the installation date by a licensed contractor is required when requesting warranty service. Present the sales receipt, building permit or other document which establishes proof and date of installation. In the absence of acceptable proof, this Limited Warranty shall be deemed to begin one hundred twenty (120) days after the date of manufacture stamped on the System. c. This Limited Warranty applies only to Systems purchased on or after April 1, 2015, only while the System remains at the site of the original installation, and only to locations within the continental United States, Alaska and Hawaii. 2) THIS LIMITED WARRANTY DOES NOT COVER: property damages, malfunction or failure of the System, or personal injury caused by or resulting from: (a) accident, abuse, negligence or misuse; (b) operating the System in a corrosive or wet environment, including those containing chlorine, fluorine or any other hazardous or harmful chemicals or environmental factors, including sea- or salt-water; (c) installation, alteration, repair or service by anyone other than a licensed contractor or other than pursuant to the manufacturer’s instructions; (d) improper matching of System components; (e) improper sizing of the System; (f) improper or deferred maintenance contrary to the manufacturer’s instructions; (g) physical abuse to or misuse of the System (including failure to perform any maintenance as described in the Operation manual such as air filter cleaning, or any System damaged by excessive physical or electrical stress; (h) Systems that have had a serial number or any part thereof altered, defaced or removed; (i) System used in any manner contrary to the Operation Manual; (j) freight damage; or (k) damage caused by force majeure or other factors such as power surge damage caused by lightning and fluctuations in or interruptions of electrical power. 3) THIS LIMITED WARRANTY ALSO EXCLUDES: (a) SERVICE CALLS WHERE NO DEFECT IN THE SYSTEM COVERED UNDER THIS WARRANTY IS FOUND: (b) System installation or set-ups; (c) Adjustments of user controls; (d) Systems purchased or installed outside the continental United States, Alaska and Hawaii; or (e) Systems purchased or installed prior to April 1, 2015. Consult the operating instructions for information regarding user controls. 4) This Limited Warranty shall not be enlarged, extended or affected by, and no obligation or liability shall arise or grow out of, MEUS providing, directly or indirectly, any technical advice, information and/or service to original owner in connection with the System. 5) EXCEPT AS OTHERWISE PROVIDED IN THIS LIMITED WARRANTY, MEUS MAKES NO OTHER WARRANTIES OF ANY KIND WHATSOEVER REGARDING THE SYSTEM. MEUS DISCLAIMS AND EXCLUDES ALL WARRANTIES NOT EXPRESSLY PROVIDED HEREIN AND ALL REMEDIES WHICH, BUT FOR THIS PROVISION, MIGHT ARISE BY IMPLICATION OR OPERATION OF LAW, INCLUDING, WITHOUT LIMITATION, THE IMPLIED WARRANTIES OF MERCHANTABILITY, NON-INFRINGEMENT OF THIRD PARTY RIGHTS, AND OF FITNESS FOR ANY PARTICULAR PURPOSE. NO ONE IS AUTHORIZED TO CHANGE THIS LIMITED WARRANTY IN ANY RESPECT OR TO CREATE ANY OTHER OBLIGATION OR LIABILITY FOR MEUS IN CONNECTION WITH THE SYSTEM. MEUS DISCLAIMS ALL LIABILITY FOR THE ACTS, OMISSIONS AND CONDUCT OF ALL THIRD PARTIES (INCLUDING, WITHOUT LIMITATION, THE INSTALLING CONTRACTOR) IN CONNECTION WITH OR RELATED TO THE SYSTEM. 6) UNDER NO CIRCUMSTANCES SHALL MEUS BE LIABLE FOR ANY INDIRECT, INCIDENTAL, SPECIAL, PUNITIVE OR CONSEQUENTIAL DAMAGES INCLUDING, WITHOUT LIMITATION, INFRINGEMENT OF THIRD PARTY RIGHTS, LOST GOODWILL, LOST REVENUES OR PROFITS, WORK STOPPAGE, SYSTEM FAILURE, IMPAIRMENT OF OTHER GOODS, COSTS OF REMOVAL AND REINSTALLATION OF THE SYSTEM, LOSS OF USE, INJURY TO PERSONS OR PROPERTY ARISING OUT OR RELATED TO THE SYSTEM WHETHER BASED ON BREACH OF WARRANTY, BREACH OF CONTRACT, TORT OR OTHERWISE, EVEN IF MEUS HAS BEEN ADVISED OF THE POSSIBILITY OF SUCH DAMAGE. IN NO EVENT SHALL MEUS’S LIABILITY EXCEED THE ACTUAL PURCHASE PRICE OF THE SYSTEM WITH RESPECT TO WHICH ANY CLAIM IS MADE. 7) SOME STATES DO NOT ALLOW LIMITATIONS ON WARRANTIES OR EXCLUSIONS OR LIMITATION OF DAMAGES, SO THE ABOVE LIMITATIONS OR EXCLUSIONS MAY NOT APPLY. 8) DISPUTE RESOLUTION. For any dispute with MEUS, you agree to first contact us by phone (800-433-4822) or e-mail (CustomerCare@hvac.mea.com(link sends e-mail)) or U.S. Mail at Mitsubishi Electric US, Inc., ATTN: Customer Care, 1340 Satellite Blvd., Suwanee, GA 30024, and attempt to resolve the dispute with us informally by providing your name, address, and contact information and describing the nature of the dispute. In the unlikely event that MEUS has not been able to resolve a dispute with you within 60 days of your original informal claim (or sooner if, in MEUS’s opinion, a dispute is not likely to be resolved within 60 days), we each agree to resolve any claim, dispute, or controversy arising out of or in connection with or relating to this Limited Warranty, or the breach or alleged breach thereof (collectively, “Claims”), by binding arbitration before an arbitrator from Judicial Mediation and Arbitration Services (“JAMS”) located in Gwinnett County, Georgia. JAMS may be contacted atwww.jamsadr.com(link is external) and will require you to pay an initial filing fee set by JAMS (unless you successfully apply for a waiver of this fee from JAMS). All other JAMS costs associated with the arbitration will be borne by MEUS. The arbitration will be conducted in Gwinnett County, Georgia, unless you request an in-person hearing where you live, or if you and MEUS agree otherwise. If the arbitrator decides in your favor, the award may include your costs of arbitration, your reasonable attorneys' fees and your reasonable costs for any expert and other witnesses, and any judgment on the award rendered by the arbitrator may be entered in any court of competent jurisdiction. If the arbitrator makes an award in your favor greater than MEUS's last written offer, MEUS will pay you the greater of the award or $500, plus your reasonable attorney's fees, if any, and reimburse any reasonable expenses (including reasonable expert witness fees and costs) that are reasonably accrued for investigating, preparing, and pursuing your claim in arbitration, as determined by the arbitrator or as agreed to by you and MEUS. Any judgment on the award rendered by the arbitrator may be entered in any court of competent jurisdiction. You may sue under state law in a small claims court of competent jurisdiction without first engaging in arbitration, but you must engage in arbitration before suing under the Federal Magnuson-Moss Act. 9) All claims must be brought in the parties’ individual capacity, and not as a plaintiff or class member in any purported class or representative proceeding. This waiver applies to class arbitration unless such arbitration is necessary to effectuate the enforcement of the court class action waiver or in the event that class arbitration is expressly agreed to by MEUS. You agree that you and MEUS are each waiving the right to a trial by jury or to participate in a class action. 10) You may opt-out of the foregoing arbitration and class action/jury trial waiver provision of this Limited Warranty by notifying MEUS in writing within 30 days of purchase. Such written notification must be sent to Mitsubishi Electric US, Inc., ATTN: Legal, 5900-A Katella Avenue, Cypress, CA 90630, and must include (1) your name, (2) your address, (3) your warranted product’s serial number, and (4) a clear statement indicating that you do not wish to resolve disputes through arbitration and demonstrating compliance with the 30-day time limit to opt-out. 11) If any clause herein is found to be illegal or unenforceable, that clause will be severed from this Limited Warranty and the remainder of the Limited Warranty will be given full force and effect. As noted above, if a class action waiver of both court and arbitration class actions is found unenforceable, class arbitration will be expressly allowed under the Limited Warranty. 12) Residents of California and Quebec do not need to register the product in order to get all of the rights and remedies of registered original owners under this warranty. 13) This Limited Warranty gives the original owner specific legal rights and the original owner may also have other rights that vary from state to state. 14) This Limited Warranty is valid only in the continental United States, Alaska and Hawaii, and it is not transferable.